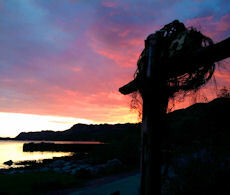 Possibly the most beautiful area in Scotland, Knoydart is a peninsula on the mainland's west coast facing towards Skye. Without road or rail links, this is a remote and rugged area offering tranquillity. The mountains are complex, with Ladhar Bheinn (Larven) dominating the peninsula above high ridges, cliffs and dark coires. We're here for a few days exploring the area and summiting fine peaks while staying in a comfortable hostel. 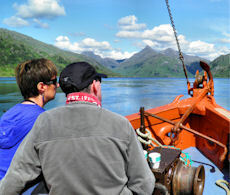 By boat from Mallaig, cross over sea to Inverie, Knoydart's picturesque little village. 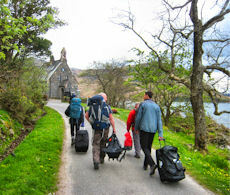 Stay in the comfortable Knoydart Foundation Bunkhouse in the heart of a vibrant community. We're here for 3 nights. Enjoy some of Scotland's finest scenery while hiking up some fabulous mountains and hills. Bag all 3 Munros in the peninsula, with the option to add in some Corbetts too ! 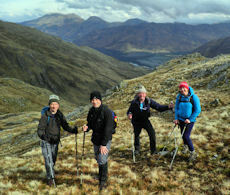 Join a small group lead by an experienced guide who has a fine knowledge of Knoydart's wilderness. This 4 day event is a guided hiking holiday with one of our experienced and qualified guides. The package includes 3 days guided hill-walking, 3 nights accommodation at the Knoydart Foundation Bunkhouse, and the Western Isles boat transport from Mallaig to Inverie. From Mallaig it's over the sea to Inverie in Knoydart, then time to explore ! Inverie is the village at the heart of Knoydart. Just outside the village is the Knoydart Foundation which has a comfortable bunkhouse where we'll be staying for the duration of the event. We'll meet up in the morning in Mallaig from where our boat takes us eastwards along Loch Nevis to Inverie. This will give us a chance to get to know each other, discuss kit and plan the days on the hills. We arrive late morning, which leaves plenty time for you to explore the surrounding area nearby. A circular hike from Inverie over the Corbett peak of Sgurr Coire Choinnichean then onto Ladhar Bheinn. Ladhar Bheinn, the peninsula's jewel with its uninterupted views over the Sound of Sleat to Skye and Rum, is aimed for on our first guided hillwalking day. On route, we can cross over Sgurr Coire Choinnichean, the Corbett peak towering above Inverie. Our first hillwalking day starts with a walk up the steep grassy slopes of Sgurr Coire Choinnichean. As we climb, the views open up and we get an insight into the layout of the mountains and lands below. Ladhar Bheinn dominates the view northwards, the hike to reach its crests is along wide grassy ridges, never difficult. The complexity of this mountain unfolds as we hike - crags, cliffs and corries drop northwards towards Barisdale Bay. We'll hike over the mountain's many tops and drop down to Gleann na Guiserein to follow a fine forestry track back to Inverie. 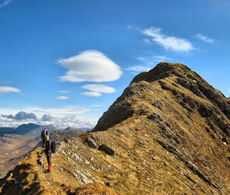 A hike to remote Munros of Meall Buidhe and Luinne Bheinn on the edge of the Rough Bounds of Knoydart. On the edge of the Rough Bounds of Knoydart, Luinne Bheinn and Meall Buidhe are rugged mountains. The terrain is rough, but the stunning views from the summit crests are well worth the effort needed ! Our second day hill-walking begins by following the Inverie River and walking up Gleann an Dubh-Lochain to the Mam Barrisdale pass. From here the views begin to open up and improve as we head up Luinne Bheinn. After spending time taking in the vast panorama from this mountain's summit, we'll drop southwards and pick up a sad looking line of old fence-posts. These lead us along a high-level broad shoulder to the foot of Meall Buidhe, where we have some easy scrambling to attain the crest. Depending on group desire and weather conditions, we may be able to return to Inverie via the nearby Corbett peak of Beinn Bhuidhe, which would add 2-3 hours to our day. Option of a bike and hike to lonely Beinn na Caillich in northern Knoydart, a hike up Beinn Bhuidhe in southern Knoydart or som time chillin' before taking the boat back to Mallaig. Beinn na Caillich sits alone in northern Knoydart. It's an easy hike to reach the summit from where views to Skye, Beinn Sgritheall and beyond can be savoured. We don't plan to leave Inverie until around 3pm, we therefore have plenty time for some more hiking ! We recommend leaving Beinn na Caillich for this day, as although it is fairly remote, there is a fine track for much of the way which is ideal for some trail-biking ! However, the sun may be out and you may wish to simply relax by the bay taking in the view, or opt for a more leisurely hike up to Beinn Bhuidhe in southern Knoydart, it's entirely up to you ! 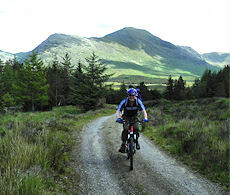 For the most part, the routes are on fine tracks in the glens, leading up grassy slopes to mountain crests and ridges. There is some rough terrain higher up, occasionally involving some clambering over rocks, but none of this is difficult enough to be graded 'rock-scrambling'. Food for the hillwalks and other supplies can be bought in the large Co-op supermarket in Mallaig by our ferry departure point. You can choose to cook evening meals in the bunkhouse or eat in one of the places in and around Inverie that do evening meals. For exploring the peninsula and our final day heading to Beinn na Caillich, you are welcome to bring a mountain-bike. Bikes can be hired in Inverie. Leading the event on 15-19 July'19. We'll meet in Mallaig which is around 40 miles west of Fort William. There are good public bus and train transport connections to Fort William and on to Mallaig. We may be able to offer pick-up from Fort William if required. Your package includes 3 nights accommodation in the Knoydart Foundation Bunkhouse, and the Western Isles boat transport from Mallaig to Inverie.